It has been said that great leaders have great emotional intelligence. But what is emotional intelligence, and how can you use it to develop your leadership? 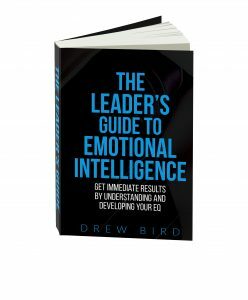 Drawing on his experience of working with literally hundreds of leaders from a broad range of industries and sectors, seasoned organizational and leadership development practitioner, Drew Bird, shares what he has learned and reveals how you can get immediate results by understanding and developing your emotional intelligence. Join Drew as he explores how core values and underlying beliefs drive your leadership behaviour, before explaining the most common mistake leaders, and organizations make when they develop leadership skills. He will also take you through an exploration of one of the most popular models of emotional intelligence in use today, before explaining in depth the simple yet effective EQ 1-2-3 process that you can use today to kick-start your emotional intelligence development plan. Coupled with exercises, activities, and reflections, this is a one-of-a-kind guide for any leader, whether on the front line or in the executive suite, who is interested and committed to developing the very highest levels of leadership.